I had a G2 that it took 4 screens before finally getting one that worked. I am now replacing a screen on a different G2 and I am on the second screen. I tested the phone by re-installing the broken screen and the broken screen works just as it did before removing it to be replaced. The bad screens display vertical lines with a white background. Has anyone else had this problem with replacement G2 screens? Are you using the same supplier for all of your screens? I'm having this issue with my LG G5, bought in April of 2016. Mine o erheats like painful to the touch too. I'm sending to lg for repair. My LG G2 brings the integrated battery, ie that part where the tape sticks does not, in this case in that part would hit the tape? A grey white washed screen? I experienced this problem when replacing my screen and found out why this is happening.. 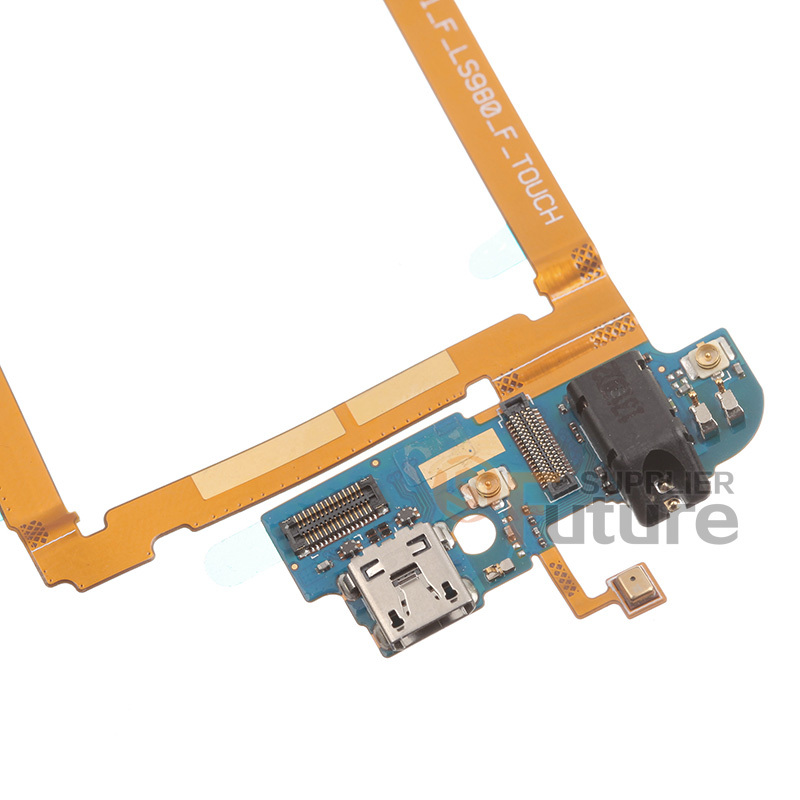 When connecting the ribbon from the screen onto the bottom board that has the charging port (this), the ribbon has a small amount of circuitry and components (the second piece from the left). The original would have adhesive to stick to the (charging port) board, and the absence of that means that the circuitry will touch against the metal part of the (white) antenna cable that is connected there too. After trying (and failing( to adhere the ribbon firmly to the board underneath, I simply cut a small piece of electrical tape and placed it in between the antenna and ribbon and solved the problem. I had this exact problem (milky white with streaks) and this fixed. I used a piece of plastic and put it in place with tape. I can confirm that this was also the problem on the LG G2 I was repairing. Here is a 'before' and 'after' photo of the area that I placed a small piece of Scotch 3M Super 88 vinyl electrical tape over to resolve the issue. Thank you so much everybody specially Craig Jessup to post the pictures, yes, it was causing the problem and the fix worked. I found that my lines were coming from the bottom part next to the LCD connector. It's not a connector but it's suppose to sit flat. The gap is what was causing the lines in the screen. I put electrical tape on it to hold it down and I haven't had any more issues. See image! PROBLEM SOLVED!!!!!! MANY THANKS!!!!!!!! Just do what the man says! Electrical tape where the picture shows, maybe you have to unplug the antenna first (white cable)! Very easy to fix! As before, I've had a big Dropbox clean out, so my old links to the photos posted previously are no longer valid. To get around this being an issue in the future, I've uploaded the photos directly to my iFixit account. Thank you so much Craig Jessup to post the pictures, it really works. I have done the isolation like on the picture on 2 different screen but still nothing where my broken display well. I have notice a little blue tape on the left of the ribbon that i found on my broken one (original)but not on the 2 replacement ist it matter? or there is a particular kind of tape you use to fix? if i completly remove the white antena cable (as test) should the screen work correctly? The white antenna cable doesn't affect the LCD, so don't worry about that side of it. Make sure the tape you're using is electrical insulation tape - you don't want any residual charge whatsoever getting through it. It's plastic tape, usually made from vinyl. The blue tape you mention just sounds like packing tape to keep the connector from moving about too much in shipping. The white lines are a real problem for the LG G2! LG says they are part of the screen 'cause they used the zero gap technology, so every G" should have it; on some devices they are too much visible and so this is an issue! Old Turkey, I changed suppliers on 2 of the screens and still the same results. I am wondering if there is something in the "after market screens" that is causing this or if it is something in the phone programming since the old screen always works other than the cracks and dead spots. I have an LG G. I am guessing it is an older model of the phones pictured here. It too has these crazy white lines all through the screen. I took it apart to cover with tape the little circuit board you suggested covering. Your pictures and description were excellent. Unfortunately, underneath the back cover inside the phone looks nothing like what is photographed. Because my phone is a LG G? What if anything can I do? When i was installing the latest cm12.1 nightly, after trying a few other roms, i also installed, by mistake, an old jb bootloader/bootstack. As result the phone entered in Bootloop, but not a normal bootloop, on the screen start appearing some crazy interferences and then the phone boot up, but the screen not. The phone made sounds and the touchscreen work, but the screen was black/off. Bob Gorden 가/이 대단히 고마워 할 것입니다.